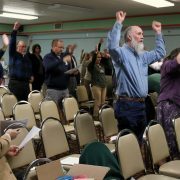 Click here to view photos from the District Cabinet Meeting! I wanted to take a few minutes to put a challenge to you and your clubs. My challenge for you is to consider how you can change for the future, or even the present. I’ll have more detail about this my GMT Message in the October newsletter. As you read it, I ask you to think about what you can do to consider appropriate changes in your club. 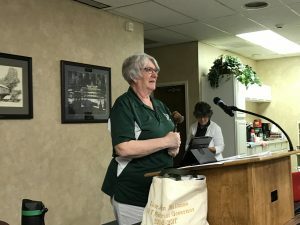 For some perspective, I’d like you to read this article about Why Our Service Clubs Are Dying (and how to fix them). 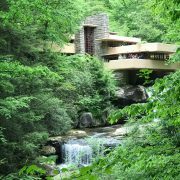 It’s intended to be thought-provoking, but also to give us ideas about what we can do for the future. We still have to determine what’s right for our clubs and our communities. I hope that these ideas spark ideas for what you can do to strengthen your club and continue to say that We Serve. Lions Are the Biggest Ever! http://palions14t.org/wp-content/uploads/2017/06/IMG_3568.gif 863 1046 John Mallonee http://palions14t.org/wp-content/uploads/2019/01/CA30F673-4264-4EAC-9FB7-E75CAD05EE1A-300x111.jpeg John Mallonee2017-06-17 02:39:482017-06-17 02:39:48Lions Are the Biggest Ever! This morning, we concluded our last cabinet meeting of the year. Each year, we vote on distributions for specific district projects from the amounts collected from clubs throughout the year. As Disteict Governor, I appreciate the work of our cabinet this year, and especially all the work done by our clubs. It’s amazing the impact we have within our four counties and beyond. Today was also the ceremonial passing of the District Governor gavel. It was my honor to hand it over to DGE Lion Kathy Fouse. I wish her all the best as she heads to the International Convention later this month. 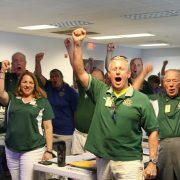 Let’s finish this year strongly and continue on into the second century of Lionism. 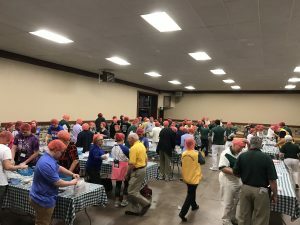 In our last post, we talked about the first couple days of the convention including the service project we had to feed 180,000 people. That evening, we continued with the International Banquet. 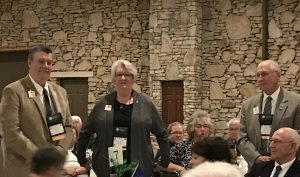 The banquet started off with the presentation of our District Governors-Elect including our own DGE, Lion Kathy Fouse. We also got to hear from our guest and featured speaker, International President Chancellor Bob Corlew. 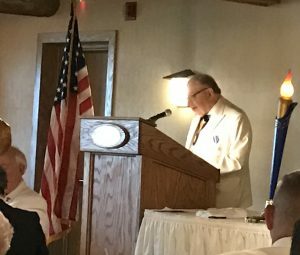 He shared some great stories with us from his year as President and gave us encouragement as we move into our second century as Lions. Here’s a picture of him with Past International Director Robert Miller as they recognize one of our state Lions. Sunday morning began with voting and a State Council business meeting to review the results of the voting and of the whole convention. Posted around the room were all of the centennial banners from the 17 districts in the state. As you can see, District 14-T’s also hung proudly with the signatures from our Lions, Lionesses, and Leos. 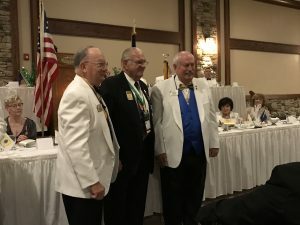 Finally, on Sunday evening, we had our Honors Banquet where we recognized our DGE’s and “pinned” them with a District Governor pin. 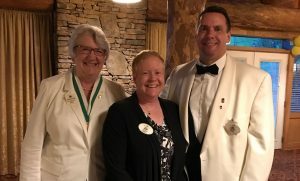 We are all so proud of DGE Lion Kathy and wish here all the best as she heads to Chicago later this month. All in all, the State Convention was a wonderful experience and I’m so happy to have seen so many Lions and Lionesses from District 14-T. The Lions. 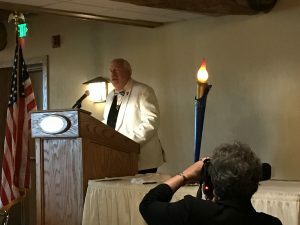 Lionesses and Leos of District 14-M and Multiple District 14 sadly report the recently passing of Past District Governor James E. “Jim” Higinbotham last Tuesday, May 23, at the age of 88. Visitation for PDG Higinbotham will be held Friday, May 26, from 2-4 p.m. and 7-9 p.m. at Schrock-Hogan Funeral Home & Cremation Services, Inc., 226 Fallowfield Avenue, Charleroi. A Lions Service of Remembrance will be held at 8 p.m. at the funeral home. Lions in attendance are urged to gather at 7:50 p.m.
Funeral services for PDG Higinbotham will be held at 11 a.m. Saturday at the funeral home. Interment will follow in the Maple Creek Cemetery in Fallowfield Township. 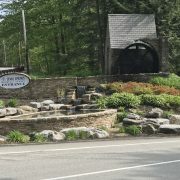 In lieu of flowers, donations may be made to Fallowfield Township Volunteer Fire Department, 1660 Route 481, Charleroi, PA 15022 or PA Lions Beacon Lodge, 114 State Street, Mt. Union, PA 17066. PDG Higinbotham served as 14-M’s District Governor during the 1990-1991 Lions year. 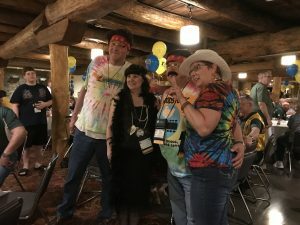 He became a Lion in 1981 and was originally a member and past president of the Fallowfield Lions Club, to which he belonged at the time he served as District Governor. 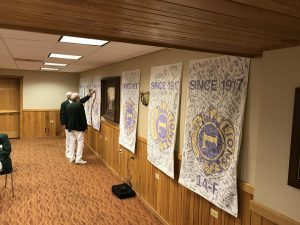 In 1999, he transferred his membership to the Beallsville Centerville Richeyville Lions Club. 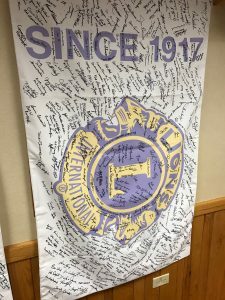 For the last 10 years, PDG Higinbotham has been a member of the Roscoe Lions Club. PDG Higinbotham was a Melvin Jones Fellow. 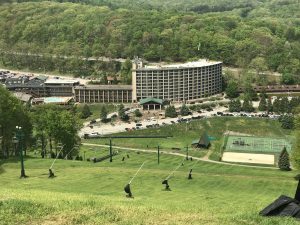 This weekend, we’ve been having an enjoyable, informative, service-filled experience at the Seven Springs Mountain Resort of the Laurel Highlands. 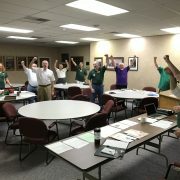 Lions, Lionesses, and Leos from around the state gathered starting on Thursday for our State Council meeting. They also traveled to the Geyer Theater for a presentation of “Miracle Worker”. 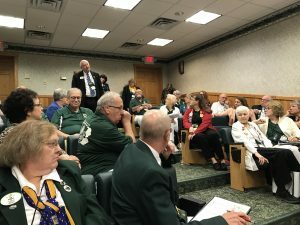 Friday began early with a series of information sessions on topics including the USA/Canada Lions Leadership Forum, Membership and Retention, Women and Family Membership, ABC’s of Lionism, and Service Projects. Our International President Counsellor Bob Corlew even joined us in the sessions to share his thoughts. That evening we had a dinner of the Pennsylvania Counsellors (PDG’s). After comments from Past International President Joseph Wroblewski and International President Bob, we had a tremendously engaging storytelling engagement by Kevin Hartigan of the Perkins School for the Blind. Dinner was followed by an inspiring Necrology Service where we remembered Lions and Lionesses who passed during 2016. Lions sure know how to have fun as seen above. Our Hospitality event started with fireworks on the slopes outside the lodge, and continued with Lions and Lionesses dressing in attire from the 10 decades since Lions began in 1917. Saturday began with additional information sessions, but we also took a few minutes to remember our dedication to the environment. 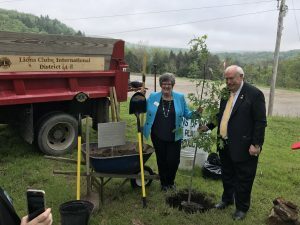 International President Bob and his partner in service Lion Dianne planted a tree on the hill above the resort. To see more pictures from this quiet moment with our President, see this album. Back in the conference center, we also spent the afternoon packing meals for 30,000 people. As you can see, we had Lions, Lioness, and Leos participating in this tremendous service project at the convention. Well, the convention isn’t finished yet, but this is a quick snapshot of what we’ve done so far. Stop back later for more! This website is a work in progress. Please check back frequently for updated content! Until our site is completely ready, visit our current site at https://sites.google.com/site/palions14t.